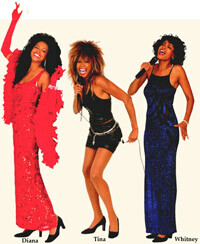 Joanna Maddox pays tribute to Whitney Houston, Diana Ross and Tina Turner. Joanna is an exceptional vocalist with the looks and the pipes. Due to her striking resemblance of Whitney, when Joanna takes the stage as the elegant �Whitney Houston� she is stunning. With Joanna�s combination of great vocals, stage presence, awesome costumes, high energy, and outrageous hair get ready to enjoy a fabulously entertaining event. Joanna has performed her array of characters at corporate events and casinos, nationwide. Joanna Maddox was nominated for Best Historical Impersonation, IGCITA Cloney Awards 2004. She has been featured on the Jay Leno Tonight Show and Good Day Atlanta. Her performances have taken her from Vegas to Paris France. Joanna Maddox grew up singing in her church choir and is no stranger to the performing arts. She studied theatre at the University of GA and she has appeared in many national television and radio commercials, corporate films and the television series, �In the Heat of the Night.� She is a member of Screen Actors Guild, the American Federation of Television and Radio Artists and the International Guild of Celebrity Impersonators and Tribute Artists. Live Stage Show, Corporate Events Meet & Greet, Photo Ops for Conventions.